A proposed 122-mm SPG on the basis of the SU-76. No prototypes were built. Quite poor accuracy and slow aim time on both guns. Occasionally misses fully aimed shots. Almost a half minute to reload top gun, DPM is lowest of all tier V SPG's. 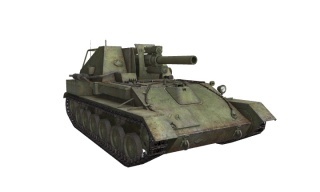 So, you have a brand new SU-122A in your garage? With the best crew and equipment credits can buy. You've got a 75% crew, an artillery rammer and a gun laying drive. What could you expect from this tier V SPG then? The mobility of the SU-122A is adequate. While its top speed is only 30 kmp/h, a power to weight ratio above 15 is enough to get the SU-122A where it needs to be. Due to its decent acceleration and traverse, combined with its compact size, the SU-122A has the potential to become a deadly ambush tank. If you can lure tanks to expose their side to you rounding a corner, you can severely damage them at point blank range. However, with your long reload time you should not expect to fire a second shot unless you have plenty of team support. The difficulties begin when it's time to fire the gun in artillery mode. The stock 122 mm M-30 of the SU-122A comes with large dispersion and an insignificant burst radius. Fully aimed shots are typically required for a reasonable chance to hit a target. And to cause substantial damage direct hits are necessary given the small burst radius. Unfortunately even fully aimed shots will often miss. 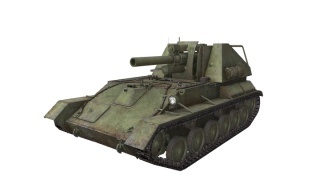 Aiming the SU-122A is an excruciatingly slow process and to fire a fully aimed shot with the above crew and equipment layout will require more than 11 seconds of aim time. Any potential target will have plenty of time to move away before a fully aimed shot can be fired. Also a spotted tank might disappear in about 10 seconds if no longer visible to your team mates and having a target disappear before the shot is fully aimed is naturally not helpful when attempting to hit said target. The long aim time of the SU-122A gives it a sluggish response which makes it difficult to hit targets of opportunity. Instead one will often have to rely on pre-aimed shots, hoping for an enemy tank to appear near the pre-aimed target point. Which is fine when a target does appear but less so when the result is staring at an empty piece of ground, waiting for a target which never shows. Because of the awkwardly long aim time of the SU-122A, there won't be many opportunities to fire fully aimed shots at visible targets in a game. Furthermore, when a target do remain visible in the open long enough that SU-122A can fire a fully aimed shot, then this target can also typically be shot by some of your allies. Allies which generally will aim and fire much faster than the SU-122A, meaning your intended target will likely explode before you're able to fire at it. 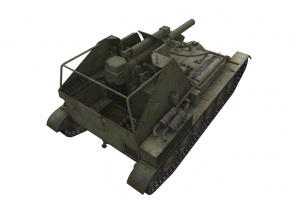 The top 152mm D-1 of the SU-122A comes with the same awkward aim time and large dispersion as the stock gun. The reload time is furthermore nearly twice that of the stock gun, so the rate of fire of the 152mm top gun is nearly cut in half compared to the stock gun. This is not as bad as it may sound however, as nearly all those shells from the stock gun would have missed their targets anyway to create nothing but expensive holes in the ground. What the top gun offers is higher damage, a much larger burst radius and the ability to stun the target. When that rare opportunity does arise and the SU-122A is finally able to fire a fully aimed shot at a target which have not yet disappeared or been destroyed by your allies, the 152 mm top gun is more likely to catch the target within its burst radius, will do more damage when it does and may also generate some secondary damage if your allies can hit a stunned target. These are significant improvements and it's arguably even more important to have the top gun if the crew has not yet reached 100% as they'll be hard pressed to hit anything with the stock gun. 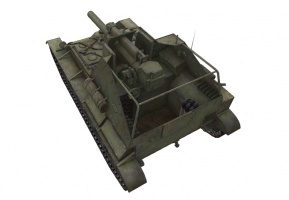 With a 100% crew you could perhaps go back to the stock 122mm M-30 gun to check if the crew is good enough to leverage the higher DPM the stock gun provides. Aiming... aiming... aiming... and the target moves away. Aiming... aiming... aiming... and the target disappears. Aiming... aiming... aiming... and the target is destroyed by allies. There will be lots of aiming done. There will be lots of missed opportunities and targets lost. There will be lots of shots going astray. Few targets will be hit and little damage will be done. If that is the gameplay you're looking for, the SU-122A might be the SPG for you. Else you might find it a less than rewarding grind. This page was last modified on 7 May 2018, at 12:32. This page has been accessed 65,392 times.